At the periphery was a rogues gallery of characters, many whose identity were never volunteered or ascertained. It was genuinely as if I was living a role as a protagonist in an international thriller, and I loved it. I have always found this to be true of spies and soldiers who engage i covert work: Once they get over the hurdle of being confident you will not betray them or they won’t be killed for having contact with you–a very dangerous and often impossible task–they are anxious to talk; to correct misinformation they have read; to defend or explain their work; to impart information that they have found interesting or important; to boast of their unique knowledge, access, or talents and achievements; to complain about the politicians who are interfering with their mission; and, not the least, to share and engage in the normal human desire to gossip and banter with someone else who shares an interest in what is usually very lonely isolating work. These were all true with Khmer Rouge General Khem Nuon, who became my close friend and ally. When I was led to a jungle hut in July 1997 to be briefed on the tumult and carnage that had led to the arrest of Pol Pot, I was met by a small delegation headed by General Nuon who was dressed in full Chinese PLA style military uniform. General Nuon I knew only by reputation and from years of pouring over intelligence documents and military organigrams where his name cropped up as a top military field commander. Nuon, who weeks earlier had been ordered killed by Pol Pot, had in turn led the forces that crushed him in June 1997, and was now clearly in control as the top field commander of the Khmer Rouge as Ta Mok’s army chief of staff. In war, it is, ultimately, the guy with the guns and the troops–not the political leadership–who has the power to make things happen, and Nuon was Ta Mok’s top man. As such, he had immense power and influence to get me access to people, places, and information. With Nuon, I had hit pay dirt, and I began to focus relentlessly on developing a good relationship with him. He was immediately likable, with kindly, sincere, crinkly eyes. With a shy and easy laugh and chuckle, he would giggle constantly, childlike in his curiosity and his desire to please. He had the natural traits of great leaders everywhere; competent, hardworking, smart, trustworthy. 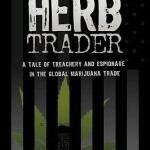 He was also, I made sure never to forget, an accomplished and ruthless killer. General Nuon’s biography was similar to many Khmer Rouge senior cadre and military officers. He was once one of Cambodia’s best and brightest. A peasant boy who had won a scholarship to Cambodia’s most prestigious university–Sisowath–he was an accomplished mathematician.. He scored the highest int he entire country in his mathematics entrance examinations the year he took them. But he drooped out in 1972 to join the revolution, disappearing into the jungles where he was destined to spend his entire adult life.. In 1976, soon after the Khmer Rouge took power, he was sent for secret naval, language and other training to China, a reward bestowed only on the most promising of Khmer Rouge officers. When the Vietnamese invaded Cambodia on Christmas day 1978, and drove Pol Pot back to the jungles, Nuon flew back from China to Bangkok and disappeared over the Thai border into the forest once again. 18 years later, we met in those jungles and began a close friendship. Nuon spoke fluent Chinese, Thai, French, and competent English. I was the first Westerner he had ever met, save for the one he had arrested and executed with a bullet to the back of the head a few months earlier in 1997. Nuon was unquenchable in his curiosity to know everything about how the world worked. 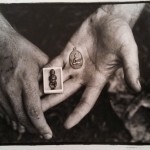 Our friendship was critical to my access to the inner sanctums of the Khmer Rouge, which, while excellent–indeed unsurpassed–in recent years, now became, overnight, genuinely remarkable. Nuon would call me from the jngle or wherever he was daily on his new favorite toy–a cellular telephone–just to chat. ” What are you doing today? he would giggle. The overthrow of Pol Pot and General Nuon’s concomitant ascent to power within the Khmer Rouge hierarchy was immensely liberating to him. As Ta Mok’s most trusted aide, and bolstered by his language skills, he was tasked with liaising with the unknown world outside the isolated, forbidden Khmer Rouge jungle enclaves. Secretly, General Nuon came to my house in Bangkok scores of times, accompanied by Thai military intelligence escorts and handlers in unmarked pickup trucks who would lurk around my garden while Nuon drank hot tea with lots of sugar and peppered me with questions from politics to popular culture into the night. Sometimes, the Thais would get nervous and balk at his meetings with me and forbid him to come to my house. Nuon relished in giving them the slip from his Thai military safe house, where he stayed in Bangkok, and sneak over to my place in a taxi. Other times, he would call me and say it was urgent that I make my way to the Khmer Rouge jungle headquarters at Anlong Veng, or some obscure rural noodle shop in a remote Thai border village. There he would seek advice whether some political or military strategy the Khmer Rouge leadership were considering would be prudent or effective. Over time, I became General Nuon’s filter to explain how the world outside the jungles worked, which was critical to the new mission that Ta Mok had bequeathed him: to figure out how to salvage the remnants of the Khmer Rouge movement by establishing relations with an outside world that they had totally cut off for decades. He would take copious notes gathered from shortwave radio broadcasts or something he had read and ask advice and analysis of each countries policy toward Cambodia, of what strategy might further them towards cutting a peace deal, and, importantly, what to do with Pol Pot, who was being held under arrest behind Nuon’s house. There, in a one room teak house on stilts with a rattan roof and a small vegetable garden tended by Pol Pot’s wife and 12 year old daughter, Pol Pot was confined with no books or access to visitors until General Nuon and Ta Mok could figure out what to do with him. This gave me unprecedented access to Pol Pot until the day he died. I literally knew what Pol Pot ate for breakfast each day, what his mood was, what was the content of the conversations he had with his wife and daughter, and who visited him. “How is the old man today?” I would ask Nuon during his daily calls to check in. No names were ever used in these telephone conversations as we both knew they were monitored by more than one government, and Nuon would recount the minutia of the mundane existence that were the final weeks and months of one of the centuries most egregious mass murderers, Pol Pot. Rumours would periodically swirl through diplomatic and journalistic circles in Phnom Penh or Bangkok on the health or status of Pol Pot or the seizure of Khmer Rouge territory by government troops, and I could confidently and accurately ascertain the true facts. I couldn’t get enough of extracting details of life within the Khmer Rouge, both historical and current. Nuon, in turn couldn’t get enough of life in the world outside the jungles, and we saw each other as a vital trusted link to each others worlds. Nuon, and is comrades, were genuinely in awe at what they viewed as my ability to take an event in their jungle and , within hours of my departure, deliver a synopsis or analysis to the masses in virtually every country in the world. They thought that I must possess extraordinary influence and power. From their perspective, they saw one guy come spend a few days with them with a television camera , a still camera, and a tape recorder and notebook, and, like clockwork, deliver an analysis of those events to every country and world leader on the planet. They did not process or comprehend that it was the rarity and import and content of the reports–not who was delivering it–that resulted in it’s wide dissemination. They would monitor the shortwave radio and within hours my voice or a synopsis of my report would be on the BBC, Australian, French, Thai, and American radio, among others. Their pictures would be on the pages of every newspaper they were given. The video would crackle over the television sets they had hooked up to car batteries on the dirt floors of their huts. World leaders would react to their comments, their voices also broadcast over short wave radio. They could not figure out how one journalist could accomplish this. 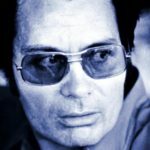 Since, in the communist bloc governments and the Cambodian political culture in general that was all they knew–that all news is State controlled, they assumed I had enormous influence with world leaders. I did nothing to dissuade them from this miss-impression. They often would get angry at my reports, disagree with them, but they knew I had the ability to get the message to the world. That fact was enormously helpful in my increasingly successful and unrelenting negotiations to gain continued and deeper access to their movement. After a whole lifetime of deprivation in the jungle, for Nuon, his life was in many ways, beginning. Grocery stores to books to modern fashion to new-fangled hi tech gadgets fascinated him. He had a thirst for knowledge for just about anything. And he would constantly make excuses to leave the jungles for my house in Bangkok to quench that thirst. Nuon, like a child at Disney world, would walk with me through the shopping malls and streets of Bangkok taking in the sights of the modern world. Over months, I painstakingly explained to him the role of a journalist in a free society, not obligated to a government or country or politics, but rather to deliver the facts for the public to determine its import and meaning and for the sake of history as a vital tool of maximizing correct and optimum public policy. Nuon thought this was a wonderful concept, and made it his mission to help me. “This is very important history. You must understand it,” he would say to me solemnly. We would have “study sessions” where he would bring his “homework” on questions I had given him on Khmer Rouge history, and he would bring back his meticulously researched information. “This is very important history. People should understand the true history of our movement.” He was genuinely committed to helping me access the facts of Khmer Rouge history, of arguing my case to Ta Mok for complete access to Khmer Rouge leaders and cadre, and, importantly, their Thai military intelligence liaisons. On my periodic trips through the guerrilla zones, Nuon was very protective. Concerned with my safety, he ensured his most trusted armed bodyguards accompanied me everywhere once we entered the Cambodian side of the mountainous jungles and descended into the Khmer Rouge controlled zones. Nuon was fond of holding my hand tightly, squeezing it, and whispering to me that he had a secret to tell me, with his other hand slicing a finger across his throat, indicating if I didn’t keep the secret a secret he would be killed. After a few months, when he began criticizing Ta Mok and expressing disagreement on Khmer Rouge policy, I knew he now trusted me implicitly. Such conduct would surely result in ruination, to put it mildly, if it were ever to become known. He would be accused of the most serious of Khmer Rouge crimes–confiding internal secrets to an American–a crime punishable by certain death. I never betrayed a confidence, and he knew it. Nuon’s trips to Bangkok became more frequent and his stays longer in the months after Pol Pot’s trial. This was good for me. In the jungles and along the border, he would be less free to talk as we were usually accompanied by other Khmer Rouge cadre or Thai military intelligence.. At my house, he felt like he could talk freely–and we did for many hours at a stretch. Like all Khmer Rouge cadre, he would talk in whispers when subjects were sensitive, irregardless of the fact that no one was even in the house with us. If someone would ring the doorbell at the front gate of my walled off compound, he would go hide upstairs, beckoning me with a loud whisper to ascertain whether they were to be trusted and he could emerge back downstairs. Other people would come over to visit, meet Nuon, and leave never the wiser that they had just been talking to the most powerful Khmer Rouge guerrilla commander. Nuon loved it and reveled in the camaraderie that we had just put one over on someone. Nuon’s every essence of existence was living a clandestine life. Nuon loved best to go wander the streets of Bangkok and go to the big modern shopping malls. He would squeeze my hand and giggle as we walked the malls, a grin on his face, wide-eyed at the array of consumer goods. We walked by a McDonald’s, which I explained was a popular American restaurant with branches throughout the world. “Is it expensive? he asked. I tried to explain a woman’s lingerie shop with skimpy, decidedly non-utilitarian underwear displayed on mannequins in the windows. “We don’t need those in the jungle,” he stated matter-of-factly, a confused grimace etched on his face. He would take my hand and hold it tightly before boarding an escalator, giggling. Nuon was having the time of his life. But it was bookstores that he loved the most, and we would browse for hours, mainly through the politics and history sections. Nuon would grab whatever interested him, and we would present them to the cashier, whom I would then pay out of my pocket. Nuon had little concept of money or how it was earned or its role in obtaining commodities. He bought textbooks to use to teach his two children, including advanced calculus books and beginning English readers. He bought a small electronic address book which he played with for weeks. He loved the function of the map of the world which would display the time zones. “Look! If it is six o’clock in Paris it is midnight in Anlong Veng!” and giggle and clasp my hand tightly. “We will be friends forever!” he would say sweetly, lock on my eyes and mean it with all his heart. Nuons trips to Bangkok in the fall of 1997 became more serious as he was diagnosed with thyroid cancer at a Thai military hospital. 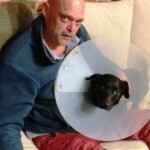 He had surgery to remove his thyroid. I would visit him in the high security wards, where he was checked in under an assumed name. I would run his medical records, diagnosis, treatment, and medications by doctor friends of mine and through intelligence agencies of foreign governments for a second opinion, and buy him medicine. He appreciated this very much. Nuon and I shared some medical maladies. Both he and I had our hearing severally damaged when our vehicles had been blown up by anti-tank mines in the jungles of Northwest Cambodia. He liked the camaraderie that evoked. There are some things shared in life one cannot explain in words, and being on the wrong side of a landmine explosion is one of them. During one of Nuon’s drop ins at my house in Bangkok, my father–a former U.S. diplomat and retired U.S. State Department Foreign Service Officer, Ambassador to Singapore and China specialist—was staying at my house during a visit and we all had dinner together, my father and the the Khmer Rouge army field commander chatting for hours in Chinese, which they both spoke fluently. 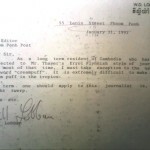 The Khmer Rouge had long known my father was a former U.S. government official and, mixing Asian cultural norms with their experience as communist trained cadre, assumed that there is no such thing as a retired U.S. government official or a son of one who was not beholden to his father and his government. It was one of things that fueled their suspicion that I was a U.S government agent. Nuon treated this encounter as a high level secret meeting between the Khmer Rouge and a senior U.S. official, grilling my father on options for a rapprochement between the Khmer Rouge and Washington. My father was not amused. When I mentioned, after Nuon had departed into the night with his entourage of Thai military intelligence agents, that he was perfectly capable of broadcasting the encounter over the Khmer Rouge clandestine radio, my father was genuinely alarmed. US policy had forbid for more than two decades any official contact with Khmer Rouge officials. He immediately called the US Ambassador to Phnom Penh, Kenneth Quinn, and reported the meeting. On several occasions, I had tried to set up a meeting between US officials and the Khmer Rouge, at the request of both the Khmer Rouge and US spooks whose job it was to observe and monitor and report on the guerrilla group and whatever they were up to. Several of my friends–spooks who worked for the US and other governments–were anxious to meet with Nuon and others. They were intelligence agents and it was frustaring to them to be tasked with trying to ascertain what the Khmer Rouge were up to and be denied permission to meet with their senior leaders. It was embarrassing for them that their bosses in Washington and other capitols would read of important developments first in the pages of the Far Eastern Economic Review. But both the US ambassadors to Phnom Penh and Bangkok denied repeatedly all such requests, fearing the leak of a secret meeting would serve as a political fodder for partisan opposition in Washington and fuel longstanding and baseless allegations that Washington was supporting Pol Pot and his army. For the Americans, the perceptions of foreign policy towards Cambodia was far and away more important than substance. It was often the case that they were interested in attempts at clever public relations excersizes than thoughtful policy. One particularly outrageous example involved General Nuon. In May 1975, only weeks after the Khmer Rouge seized power and South Vietnam fell to the North, it was then Khmer Rouge Naval battalion commander Khem Nuon who led the communist forces that fought over the captured American spy ship, the Mayaguez, and the bloody and very high profile battle that followed. More than 30 Americans were killed, many remaining unaccounted for to this day. By the 1990’s, the Americans had spent and were continuing to spend millions of dollars to try and locate the bodies of the Americans still listed as Missing In Action and piece together the events of these fateful days in May 1975. Nuon, as the top field commander for the Khmer Rouge of that battle, knew every detail and drew me maps of exactly what happened to whom when and where during that ferocious confrontation. Nuon, and now I, knew exactly where the bodies of the MIA Americans had fallen. But Washington refused to meet with Nuon, and continued sending helicopters and teams of American soldiers with shovels to dig for bones with precious little intelligence and a refusal to accept the precise intelligence available to them through General Nuon with no sTrings attached. Nuon, meanwhile, had all the answers, and I got him to agree to meet with American military intelligence to brief them thoroughly. But Ambassador to Cambodia, Kenneth Quinn, refused permission, and millions of more American dollars were spent in the following months digging holes aimlessly looking for the remains of the American still listed as Missing in Action. It was a cynical and cowardly waste of taxpayers money but an approach to foreign policy which I had long since learned to be routine. But for me, a positive side effect and consequence of this sort of approach to foreign policy and the US refusal to deal with the Khmer Rouge was that I remained the best liaison for the Khmer Rouge to the outside world. Virtually every Khmer Rouge operative I ever met knew who I was. They had a cacophonic, although usually positive, view of me. First, as relatively knowledgeable of their movement and intimate with their leaders; second, as an outsider who had spent years in their jungles–something the rank and file soldiers liked and few outsiders had been willing to do. It made me a curiosity. And three, as an American, and therefore a Central Intelliegence Agency operative of their hated enemy. That was dangerous. Thousands had been arrested, tortured, and butchered for being viewed as the same, and entirely incorrect, suspicions. There was always someone, through politics or personality, in the Khmer Rouge control zones who deeply opposed my presence and would be happy to kill me. I saw the clenched faces and focused glares of hate all the time. But General Nuon was very protective and I felt safe always surrounded by his grim faced armed bodyguards. I had no doubt that they would instantly slaughter anyone who tried to harm me. 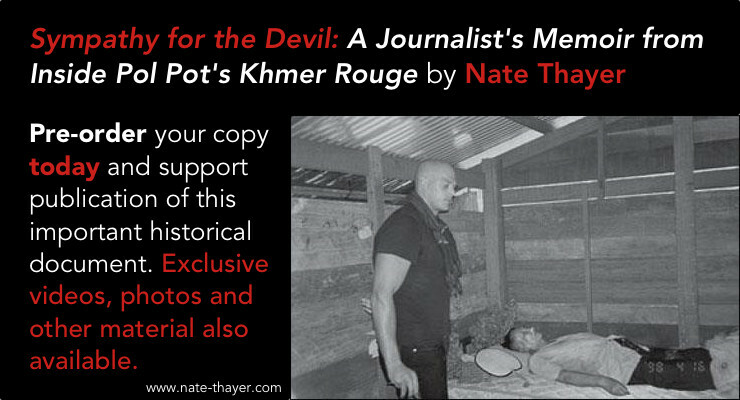 My Khmer Rouge guards knew the unpredictability of enemies in the jungle, which is why the insisted on armed Khmer Rouge bodyguards preceding, accompanying, and following me wherever I went. Pol Pot still had many loyalists, many who blamed me for humiliating and condemning him to the world. By early 1998, I had spent months debriefing the Khmer Rouge on history and current events and they had accepted me as part of the landscape. But under Ta Mok, the guerrilla movement continued to fall apart. Despite the public renunciation of Pol Pot in July and the impossibly ludicrous attempts to portray themselves as a new, improved Khmer Rouge, the simple fact was they were not fighting against anything by 1998, except the humiliation of total surrender. Khmer Rouge soldiers were tired of fighting and tired of living in the jungle and in March 1998 the discontent exploded in mutiny against Ta Mok. Fighting between Khmer rouge soldiers erupted near Anlong Veng. On March 21, two Khmer Rouge divisions stationed 30 kilometers east of Anlong Veng mutinied, taking control of their area. Nuon and his troops were dispatched to put down the rebellion. Taking advantage of their absence from headquarters, another division in Anlong Veng itself mutinied on March 24. They commandeered heavy vehicles, fired on the few defenders of the sprawling jungle town, and headed south toward government held territory with more than 500 families of the troops who were rebelling. When Nuon and his forces returned to Anlong Veng from attempting to quell the rebellion on the outskirts, people were still fleeing and confusion reigned. Some of his soldiers refused to open fire for fear of shooting their own families. Mok fled Anlong Veng to the safety of the mountain on March 22. On the 24th, the rest of the leadership ran for their lives as their houses were burned and their own heavy guns were turned against them. The Khmer Rouge headquarters at Anlong Veng had fallen–not to government troops but to their own last remaining loyalist fighters. Ta Mok and the rest of the leaders were cowering in bunkers with not much more than the clothes on their backs. By April 4, 1998, elements of ten divisions, with at least 1893 troops representing more than half the fighting force of the Khmer Rouge, had defected and were advancing up the mountain with fresh resupplies by their new government allies. It was a major, if inevitable blow to the Khmer Rouge movement. I called a number I had for emergencies that I knew to be a Chinese hand-crank phone in a hut near the Thai border. The Khmer Rouge cadre who answered greeted me with an urgency and gravely promised to get a message to general Nuon. “He is at the front line,” the cadre said, and added the leaders were all safe on the mountain. Nuon called back late that night. His voice was tired and solemn. ” I want to see you. The situation is very difficult,” he said, and he urged me to come to the border. All telephones were, correctly, assumed to be tapped and he could give me few details. “My friend, we have a lot to talk about. I will explain to you when I see you.” Nuon did confirm that Anlong Veng had fallen but said it was only temporary. The story–the first official confirmation from the Khmer Rouge–was blasted all over the front pages in Asia. Prior to that it was all second hand reports from Bangkok or Phnom Penh quoting anonymous sources or unnamed western diplomats. This was the first official confirmation from the Khmer Rouge that their headquarters had fallen. I left once again for the 8-hour drive through Northeaster Thailand to the border town of Surin. When I met Nuon the next day, details emerged. ” Ta Mok asked me to shoot the people but I did not agree because there were many women and children,” Nuon told me. Khem Nuon was close to desperate. He detailed what amounted to a collapsing movement. He and the other leaders had fled for their lives at night. His and others’ houses were burned to the ground and they had lost everything. The situation only deteriorated and behind the scenes there was a frenzy of confusion and anger, much of it directed at Ta Mok.. His last loyalists were wavering and many now were prepared to abandon the movement to save themselves. On March 26, the three Khmer Rouge generals tried with Pol Pot the previous July, and held underground in bamboo cages since then, were executed by Ta Mok. It was an act of unadulterated revenge, because some of the fighters who mutinied were said to be loyal to them. Now, thousands of guerrillas and their families were hiding in the jungle-clad landmine-strewn mountains along the Thai border, unable to find enough water and at the mercy of malaria-carrying mosquitoes. On March 29, two divisions stationed around the Preah Vwihear temples east of Anlong Veng, surrendered to the government without a fight. In an example of the divided loyalties and distrust that had now riven the movement, the division commander defected to the government, but his wife refused and returned to the Ta Mok loyalists. Despite the headline grabbing fighting, the most important development was beginning to evolve behind the scenes. The chaos within the Khmer Rouge forced Ta Mok to play his last card. On March 25, fearing Pol Pot would be captured and hoping to get international acceptance, Pol Pot was secretly moved to a sanctuary in Thailand and Ta Mok ordered his top aides to arrange his handover to the United States. 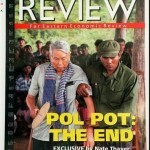 Pol Pot was being held at a remote Thai military base in the Thai border province of Sisaket, the headquarters of regiment 16, a highly sensitive Thai military unit that technically did not exist and was long charged with handling secret interactions with the top Khmer Rouge leadership. It was a stunning development. 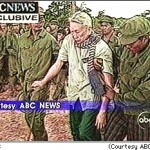 For the first time since he orchestrate the genocide that left millions of lives in ruin and after twenty years on the run as one of the worlds most wanted and notorious fugitives, Pol Pot was in custody outside of Cambodia and the decision had been made by his last protectors and loyalists to turn him over to an international court to face justice. But what followed was an extraordinary series of American bumbling that allowed one of the centuries most notorious despots to cheat justice. In flight and fearing capture, it was the beginning of a humiliating end for the man who ruled Cambodia from 1975 to 1979. He had dyed his hair black in a desperate attempt to avoid capture by mutinying Khmer Rouge troops as he fled to the Dongrek Mountains north of Anlong Veng. “Pol Pot feared that he could be caught. By dying his hair he was trying to disguise himself. For such a person to do that, it showed real fear in his mind.” said General Non Nou, who was assigned as Pol Pot’s personal jailer and security guard and was in charge of escorting Pol Pot to safety during those days. The guerrillas had been unable to provide their ousted leader with sufficient food since being forced to flee their headquarters at Anlong Veng. “For the last few weeks, he had diarroea and we haven’t had much food because of the fighting with the traitors,” Ta Mok told me the day after Pol Pot died. As Pol Pot fled, the remnants of the movement he created 38 years ago crumbled before his eyes. As he was being driven in a blue Toyota land Cruiser with tinted windows with his wife and daughter to a new hideout to avoid mutinying troops he saw more than 30,000 Khmer Rouge civilians who had been forced from their fields and villages by government troops and Khmer Rouge defectors. “When he saw the peasants and our cadre lying by the side of the road with no food and water or shelter, he broke down into tears,” said Non Nou. So when Pol Pot was turned over to Thai custody, he thought the end of the struggle had come. What an image–a six-foot-something American leading a giggly Khmer Rouge general (who I am assuming was a slighter, not-so-tall man) by the hand through the markets and malls of Bangkok. Such a surreal contrast with the scenes of the same two men in the jungles of Cambodia.